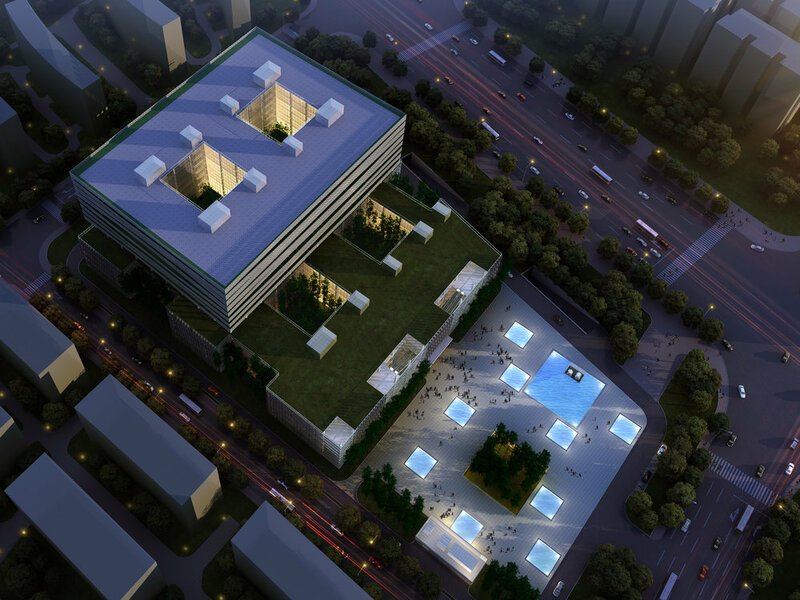 Shanghai Pudong Hospital is located in the Sanlin district of Pudong, on a total site area of 35,736 m2. Composed by a high tower building with eastern orientated annexes, the overall floor area is 114,582 m2. Four different courtyards compose the hospital’s main outside space: a city courtyard, a green courtyard, a sunken courtyard and a roof top garden. They connect the different levels of the hospital, from underground level, to the ground floor up to the top of the building and create a circular green atmosphere that every user of the hospital is able to sense. Those internal courtyards, reminding of the quadrangle residences in old Beijing (siheyuan), have various advantages: they do provide more green area for the users and bring social benefits as well as improve natural ventilation, heat reduction and help to save energy. The patient wards are located inside the high-rise building. Each levels’ balconies are shaped different in order to generate an interweaving façade appearance. In addition, the height of the balconies varies to design rising and falling zigzag lines. The zigzag system, not only in horizontal, but also in vertical direction, forms a three dimensional façade with an intense sculptural look. In addition, the balconies, together with plantation, become a circular garden, interspersed in the peripheral of the building. The outmost layer of the high tower façade is composed by metal gauze, which reminds of a lantern that is hung up. The metal gauze material helps to protect and sunshade the lower floors, too, and increases the comfort of the users. The façade of the lower level of outpatient department and emergency unit is surrounded by saw tooth stone and glass, which helps to discharge the accumulated heat and direct sunlight. Greening is the overall element in and on Shanghai Pudong Hospital, as plantation and green space can be found at the courtyards, the roof gardens and the plants of the patient wards’ balconies. With this strong theme, the word “hospital”, translated word by word in Chinese, is interpreted to its original meaning: “healing garden”. The Shanghai Pudong Hospital becomes a green island inside the reinforced concrete of Pudong.